Becoming a finalist for The Blogging Scholarship (vote for Emily!) has really motivated me to get my act together around here regarding attracting more readers, generating higher quality content, and making some money. My goal is to have some ads and other changes up and running by Jan 1. Just yesterday I had lunch with a fellow grad student and we stumbled upon a question that I’m sure many grad students do regarding taxes and residency. If you have a question regarding PF, for grad students or otherwise, that you would like me to look into, please leave a comment or email me. This is my one-month update on how EPF is doing based on our October 16 – November 15 data. This month has definitely gone better than last month and toward the end we’ve gotten a boost from people clicking through from the blogging scholarship website and my aggressive Facebook and Twitter promotions. can a person live off of a $60000 salary? 4) What Do You Consider a Good Salary? How was your most recent month? What search terms leading to your blog do you love to see? Why the heck do you think people are so interested in the average spending on clothing?? 14 Responses to "Blog Statistics Update October – November 2012"
Can someone live off of 60K? Uh yes please! I’d be happy with that salary! People are crazy. In most life situations $60k would be plenty more than enough! Perhaps not “in the style to which you are accustomed,” though. What am I going to say, right? Nope, not possible – I’m not surviving right now. I died as soon as I become independent from my parents. 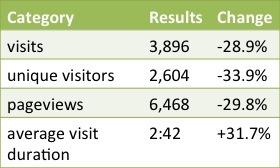 Wow, you had some great growth in your visitor and pageview numbers, congrats! Living off $60k would really depend on what part of the country you live in. Here in the midwest it would be plenty fine, but in New York that may be a different story. Thanks, Jason! The unique pageviews have been around 2k for quite some time so I’m happy to see a significant increase. ITA that it depends on the area of the country and how many people are in the household. But I’d say anywhere in the country a couple can survive on $60k – but perhaps not thrive in those most expensive cities. Interesting to see what you find on taxes and residency. When I was in grad school in PA, I had to petition the university controller to let me be considered a PA resident. I was told that b/c I was there for the purpose of being a student, I was considered a resident of where my parents lived, even if I owned a house in PA! I had to write a letter detailing how I planned to live and work in PA after graduation. Not sure if every state is the same, but that would be interesting to know. Did you attend a public or private university and was this a matter of university or state policy? I’m very surprised you had to fight so hard to gain residency as a non-dependent! It was a state university, which was strange that they made it so hard – my ‘out of state’ tuition was coming from university funds! Not sure if it was school policy or state policy, but on my paystubs it had resident of the other state, meaning I had to file tax returns in both states. We had taxes witheld (not FICA though), so I don’t know how it would have been different with a 1099. Wow, that is so weird! I don’t even know if my current paystubs reference my residency. You wouldn’t think you’d have to fight so hard to save the university money… Although I’m not sure if it makes a difference to the university ultimately (it’s just moving numbers around), unless they receive a per-student subsidy from the state, which I doubt. Kathleen recently posted..Frugal Portland Gift Swap is ON!